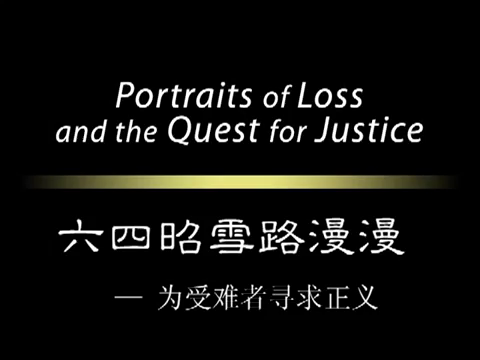 Consisting of footage shot by the Tiananmen Mothers, a group of family members of those killed during the violent crackdown on the 1989 Democracy Movement, Portraits of Loss and the Quest for Justice presents the stories of six victims told by their family members, and of two survivors told by themselves. In the absence of official accounting of the casualties of June Fourth, these stories humanize a tragic episode in contemporary China that the government has continued to suppress for nearly a quarter century. Went out to take pictures on June 3 and was shot in the back of his head and bayoneted in his abdomen. Went to Tiananmen Square to see the Goddess of Democracy statue at 10:00 p.m. on June 3. Shot on the night of June 3. Shot in the head in the early morning of June 4. Run over by an army truck on the morning of June 4. Shot in the stomach on the morning of June 4. Shot in the leg, June 6. Shot in the abdomen, June 6. Since the early 1990s, the Tiananmen Mothers have documented 202 individuals who were killed in the crackdown but believe the actual number to be in the thousands. For more than two decades, the group has presented the Chinese government with three demands: the truth of what happened, compensation to the victims’ families and survivors, and accountability for the government’s actions. The government has never responded to the group. Since its premiere in 2009 at the Asia Society in New York, Portraits of Loss has been screened in Brussels, Geneva, Hong Kong, Paris, and Yerevan.